Up to 16GB on a single SODIMM. 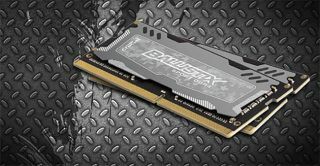 If you're in need of a RAM upgrade for your gaming laptop, you might be interested in Crucial's new Ballistix Sport LT DDR4 memory in SODIMM form. Individual modules can be had in 4GB, 8GB, and 16GB capacities, or you can opt for a dual-channel kit with Crucial offering up to 32GB in total capacity (2x16GB). Crucial's pushing its Ballistix Sport LT line at "gamers and enthusiasts." Part of that approach entails a focus on aesthetics—the new memory features black PCBs with a digital camo print on the heatspreaders. Of course, you and others will never see the modules once they're installed in your laptop, not unless you pop the hood at a LAN party like you're at an auto show. All of the modules and kits operate at 2400MHz and require 1.2V. Oddly enough for performance RAM, Crucial only lists the CAS latency, which is set at 16 on each of the modules and kits. "We’re constantly seeking ways to empower gamers with affordable, easy-to-use products that help them gain that competitive, performance edge," said Jeremy Mortenson, product marketing manager, Crucial. "With new platforms supporting faster DDR4 SODIMMs coming to the market, the newest Ballistix SODIMM module does just that."